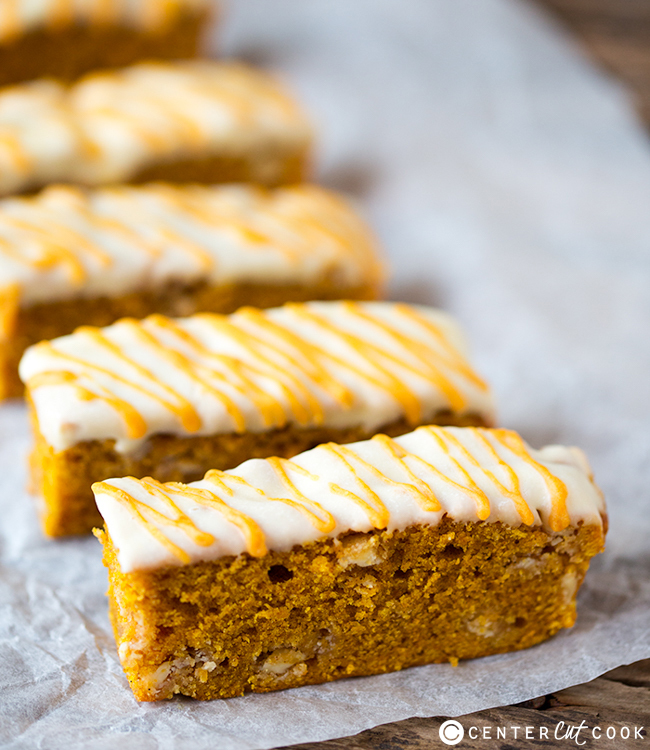 Delicious spiced pumpkin blondie bars with white chocolate chips and white chocolate topping. Perfect with your morning cup of coffee! 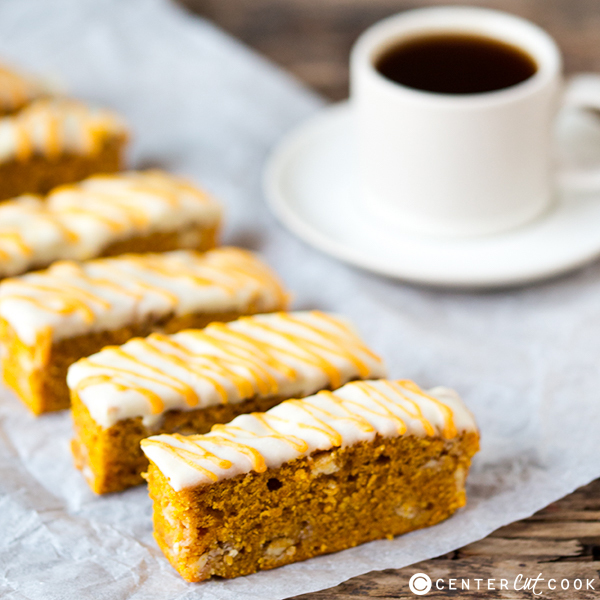 Possibly not a big deal to you, but living in the UK, we don’t really see many pumpkin recipes, so I’m excited to be involved in the pumpkin frenzy! Can you believe that they don’t even sell pumpkin puree or pumpkin spice over here? Actually, that’s not quite true, you can now find pumpkin puree on the ‘speciality aisle’ of the larger supermarkets. I spotted it for the first time a few weeks ago and it was in my trolley quicker than you could say ‘nutty English woman’. I set to work coming up with a recipe, and these chocolatey pumpkin blondies were the result. A really simple recipe that involves creaming the butter and sugar, then mixing in the wet ingredients, followed by the dry. The result is quite a thick mixture, dotted with lots of lovely white chocolate chips. After baking in the oven it’s cut into slices before being dunked in more white chocolate. I did experiment with dipping the whole thing in white chocolate, but that was just a little too much….. 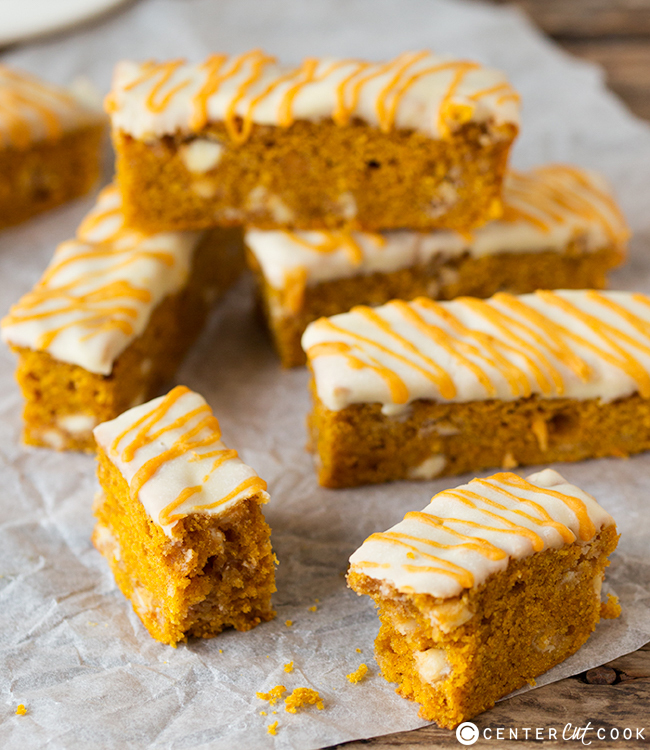 The final drizzle is simply a little pumpkin puree mixed with some melted white chocolate. 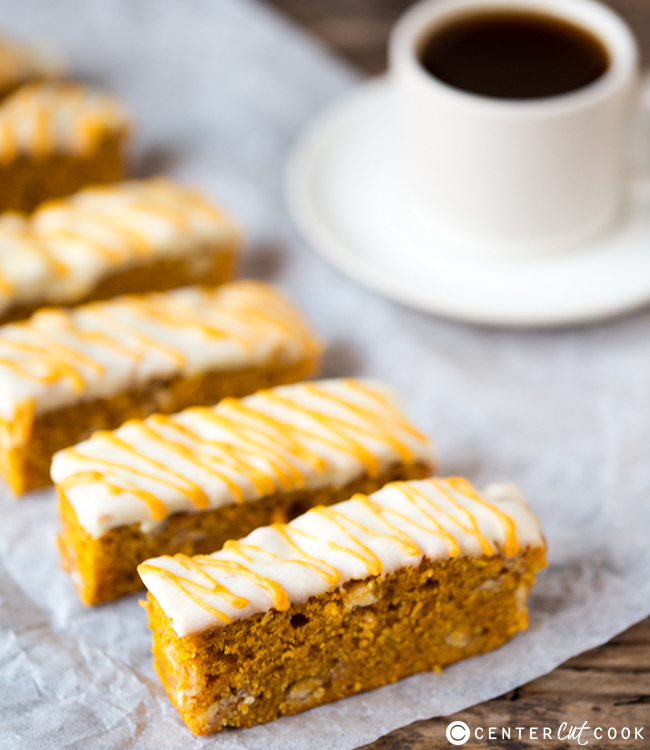 The pumpkin gives the drizzle a lovely orange colour, and the white chocolate helps it to set. So delicious with a nice cup of coffee! Preheat the oven to 375f. Line a 20cmx20cm baking tin with baking parchment. Cream the butter and sugar together, add in the egg, vanilla extract and pumpkin puree. Stir until combined. Add in the flour, baking powder, pumpkin spice mix, cinnamon and salt and thoroughly mix. Stir in the chocolate chips, then spoon the mixture into the prepared baking tin. Spread it out so it reaches the edges. Place in the oven and cook for 20-25 mins (until an inserted skewer comes out clean). Then remove from the oven, leave to cool in the tin for a couple of minutes before removing from the tin and placing on a cooling rack to cool completely. Remove baking parchment and cut into 12 slices. For the topping, melt the white chocolate in a shallow dish the microwave in 30 second bursts – stirring in between each burst. Place 2 tbsp of the chocolate in a separate bowl and put to one side. Dip the tops of the pumpkin fingers in the melted white chocolate and place back on the cooling rack. Stir the 1 tbsp of pumpkin puree with the reserved melted chocolate and either drizzle or pipe the mixture onto the pumpkin slices. Leave the chocolate to set before serving.